Festinihog & Welsh Highland Railways are celebrating 150 years of steam powered rail engines. The Princess engine was one of the first built and began her life in London and then worked her entire career in Wales. 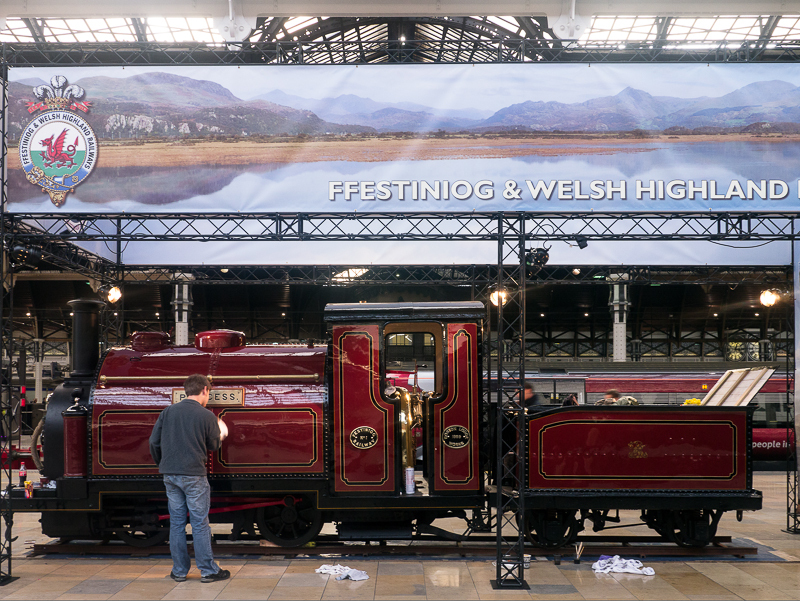 As part of the celebrations Princess has been brought back to London, standing proudly on platform 8 at Paddington station. Yesterday was St David's Day, the patron saint of Wales, so Princess was given an extra special polish. I've not seen such a beautiful engine before, just the work-a-day sort. This one is almost a piece of art. What a gorgeous little engine. I adore old trains! Now, this is a VERY old engine. Nice, Mo. Mo, Have you been to Porthmadog and ridden the railway? It really is great with stunning scenery.